The goose adventure continues. I now know more about expressions like “don’t be a silly goose.” Or “wild goose chase.” These geese are unique and comical, graceful and bizarre. As I become more excited and invested in the anticipated hatch of goslings, I am filled with questions. I have to admit that I haven’t had the guts to check the nest recently. The geese are staying very close to it, which is intimidating. Last time I checked, there were 10 eggs. I bet there are more now. 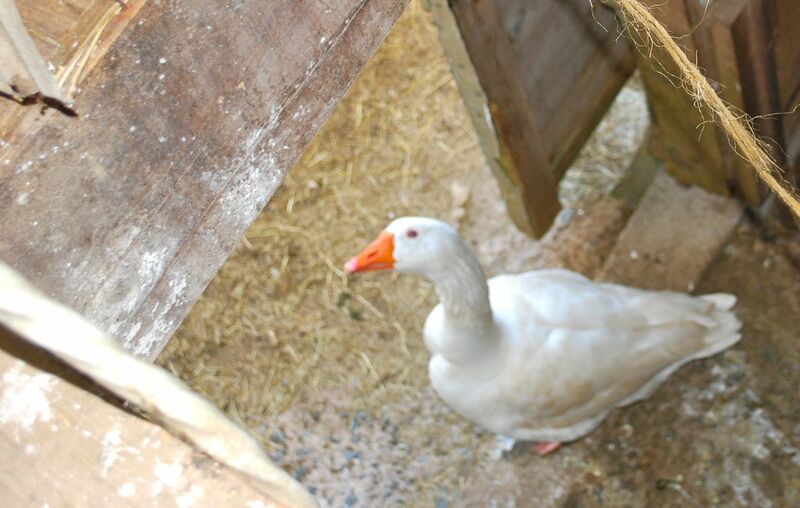 I see the goose sitting on the nest when I look down on her from the barn upstairs through a missing board in the floor. But she doesn’t sit all day. She and Mr Big go off on little grazing and honking walks. 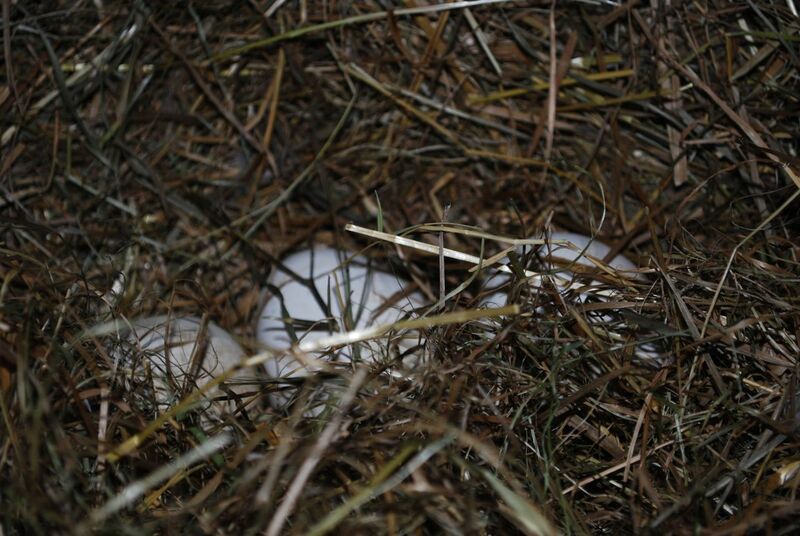 Hens sit all day and night for 21 days on their nests, with very brief breaks every once in a while. Does this mean the goose is not ‘setting’ yet? Is she still laying, and adding to her stash? If so, I hope she decides to start setting soon, because I’m getting impatient. How long can the eggs sit there waiting for mom to start sitting on them to begin the incubation process? Does burying them in the hay keep them at the right temperature and humidity to keep them on ‘hold’ until incubation begins? Does momma goose cover the nest differing amounts depending on outside temperature? Does she lay her eggs, get up, stretch, sniff the air, and carefully go about covering her nest… adjusting according to temperature and other conditions so her little potential babies get the best start possible?? My neighbor, Ruth Lapp, told me that a goose needs extra calcium at laying time. So I give my goose oyster shells along with her mixed whole grains. She’s been gobbling them up. Since I am not experienced with geese, I’m going to let the geese do their thing, and see what happens. I know I’m going backwards, but Marg also gave some good advice about getting started with geese. On January 11 Marg emailed with the following advice. I love her detailed and thorough descriptions! 1. Try to obtain a pair of breeders between now and spring, with hope that they will settle in, breed, lay and hatch goslings. Is anyone else out there raising geese? 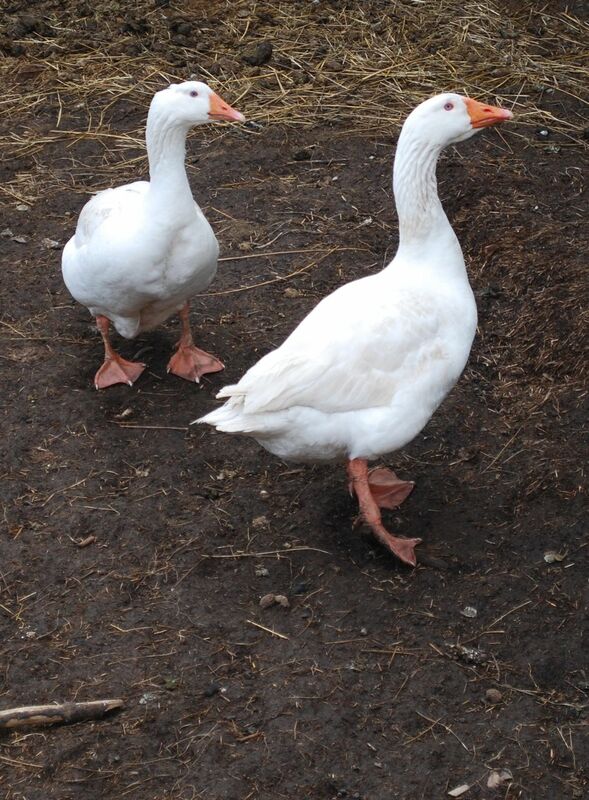 This entry was posted in efficiency, geese and tagged goose egg, goslings, incubation. Bookmark the permalink. Thank you so much for this detailed tale about your geese. We have a pair and Grace is patiently sitting on her 9 eggs while Ghandi is garding her and keeping any possible threat at bay. I really hope she will have even a couple of goslings. I think some of the eggs were too old before she started sitting on them. Fingers crossed, we’re all excited to see what she produces on of these days. Did you have any luck? We didn’t. The geese are trying again this year. 4 eggs so far. Yes Grace had 2 beautiful goslings last May. It was so exciting. We hope they will rear some this year again. She has not started laying yet, but Ghandi has gone into his protective mode, so it can’t be too far away, I think. Let me know how you get on and good luck with it. This year I’m going to collect the eggs and keep them as Marg Zillig advised. I’ll see if that works.